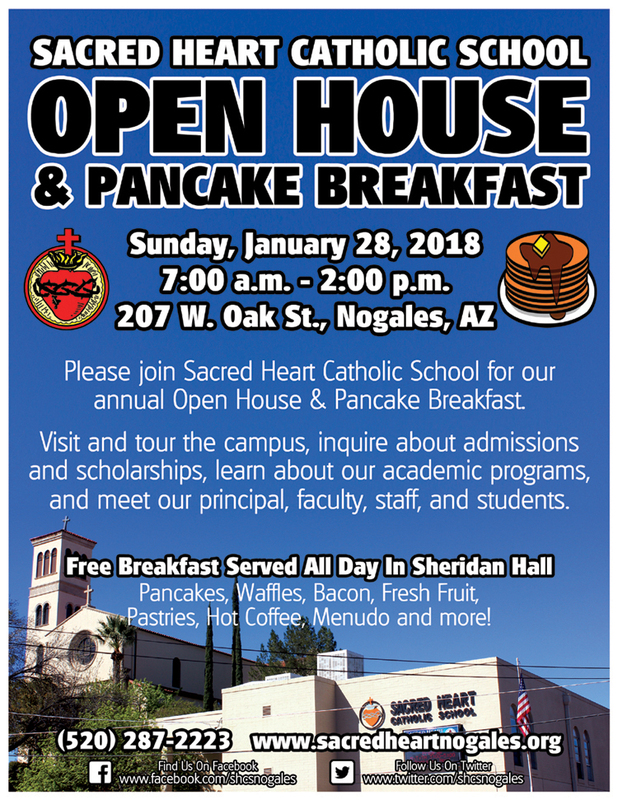 Sacred Heart Catholic School hosts an Open House & Pancake Breakfast event every year during Catholic Schools Week (late January/early February). Sacred Heart Catholic School's annual Open House & Pancake Breakfast aims to promote the school and our students, recruit new families, and give the community a chance to tour the campus. Current and prospective parents, parishioners, and community members can inquire about admissions and scholarships, learn about our academic programs and meet with our principal, pastor, faculty and staff, advisory school board, student council and student ambassadors. Free breakfast is served all day is Sheridan Hall offering pancakes, waffles, bacon, pastries, freshly brewed coffee and Mrs. Espinoza's famous menudo! When: January 28, 2018, 7:00 a.m. to 2:00 p.m.
Who: Current and Prospective Parents, Students, Parishioners, Community Members, and Friends of Sacred Heart Catholic School. Open to the Public.